Outdoor Research Capstone Heated Gloves. The pinnacle Capstone Gloves deliver big-time warmth and performance for anything from cool spring powder days to sub-zero night skiing in the heart of winter. These gloves feature the option of running two ALTIHeat™ batteries per glove and offer an enhanced heating element surface throughout the back of hand and fingers. These additions effectively double the already industry-leading and toasty-warm heat output offered in our popular Lucent™ and Heated Stormtracker™ styles. 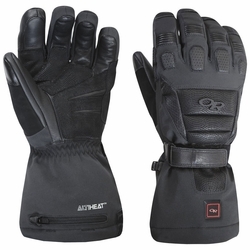 OR's ALTIHeat™ heated glove technology, PrimaLoft® Silver Insulation Hi-Loft, a GORE-TEX insert and touch-screen compatible Sensor™ leather come together to form the perfect glove for resort and backcountry adventures.